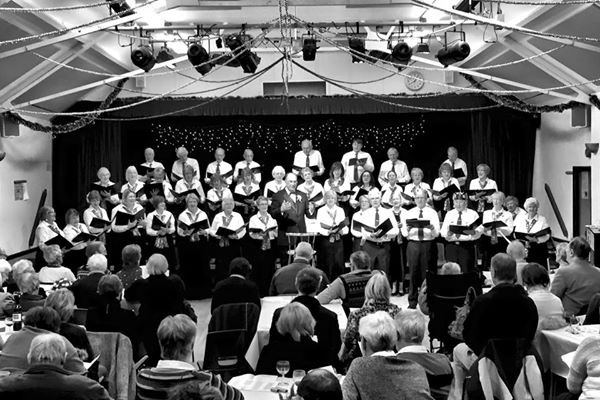 The concert opened with the full choir singing arrangements of Ralph McTell’s The Streets of London by Ralph McTell and The Sound of Silence by Simon and Garfunkel, followed by the ladies singing Ronald Binge’s Where the Gentle Avon Flows. Rebecca Joisce, playing her auto-harp, then sang in Welsh the traditional Welsh folk song, Cyfri’r Geifr (English: Counting the Goats). The Welsh theme continued with the full choir singing the popular Welsh song Myfanwy, before moving to Scotland to sing a setting of the poem, My Love Is LIke a Red Red Rose of Robert Burns and an arrangement by Terry Pearce of the traditional Scottish song, the Eriskay Love Lilt. 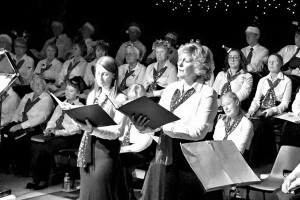 The next section of the first half featured two of the choir’s principal soloists with three favourites from the shows. Howard Feather (tenor) sang the Drinking Song from The Student Prince and was then joined by Helen Pearce (soprano) to sing Deep in my Heart, from the same musical. Helen then sang I Dreamed a Dream from Les Miserables. The choir returned to sing arrangements of Old Devil Moon and the popular musical hall song, I Do Like to be Beside the Seaside. The first half ended with a short selection from the Anthony Lloyd Webber and Tim Rice hit musical, Joseph and the Amazing Technical Colour Dreamcoat – Close Every Door, Poor Poor Pharoah, Joseph Before the King, Song of the King (soloist: Tom Hartley) and Any Dream Will Do. 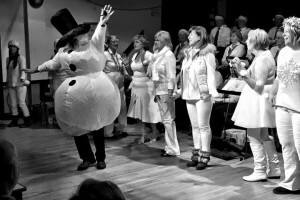 The second half opened with the traditional visit from Steventon Choral Society’s own ‘dancing girls’ (Helen Pearce, Danielle Beeken, Patricia Sadler, Trish Napper, Diana Bowder, Rebecca Joise, Deborah Bennet, Frances Broadbent and Abby Evans) with the Abba favourite, Dancing Queen. Then it was onto a performance of Summer Nights from Grease with Howard Feather (tenor) and Helen Bell (soprano) as the young lovers supported by their friends Elizabeth Dobson, Phil Brazier, Tom Hartley, Frances Brightman and Frances Broadbent.The Abba theme continued with the full choir singing three of their hits – Mamma Mia, Super-Trouper and Money Money Money. The choir then had a break while Barbara Price told the audience a story and Terry Pearce, accompanying himself on the guitar, sang the Benny Hill comedy hit, The Harvest of Love. The next choir piece was an arrangement of What Kind of Fool Am I, by Anthony Newley and Leslie Bricusse from the musical Stop the World – I Want to Get Off. This was followed by two pieces from a small group (Helen Pearce, Rebecca Joisce, Helen Bell, Abby Evans and Frances Brightman) – Chattanooga Choo Choo from the 1940s and Let It Go from the Disney animated film, Frozen, released in 2013. The concert ended with three pieces from the choir – Can You Feel the Love Tonight from The Lion King, the 1960s hit The Lion Sleeps Tonight (also known as Wimoweh) and Sit Down You’re Rocking the Boat from Guys and Dolls (soloist: Hugh Hercus). To set the scene for this concert on Palm Sunday, the choir sang three quiet and reflective hymns starting with ‘Be Still for the Presence of the Lord’ written in 1986 by David J. Evans. This was followed by an arrangement by Terry Pearce of ‘How Can I Keep From Singing’ by the Rev. Dr Robert Wadsworth Lowry and ‘Forty Days and Forty Nights in Judah’s Desert written by written by Jean Holloway and set to the tune of Scarlet Ribbons. Following the main work of the evening, Mozart’s Requiem, the choir ended the concert with Bob Chilcott’s ‘Irish Blessing’. 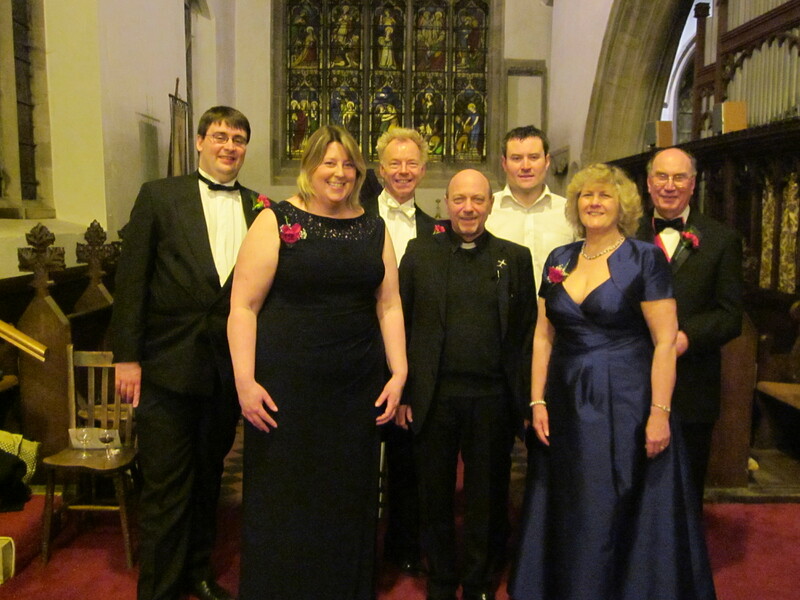 Steventon Choral Society traditionally performs its spring concert in Steventon Parish Church on Palm Sunday. This was the last concert in the Church before the retirement of Rev. Colin Patching, who has been vicar here for 25 years. ‘We Wish You a Merry Christmas’ began this concert of carols and Christmas songs. It was followed by an arrangement of the 1930s hit Santa Claus is Comin’ to Town by Haven Gillespie and John Frederick Coots, and the well-known carol, Away in a Manger, sung to a traditional Normandy tune. Then it was the audience’s turn to sing with three favourites – Once In Royal David’s City, It Came Upon the Midnight Clear and Good King Wenceslas (Page: Helen Bell, King: Howard Feather). The choir returned to sing The First Noel/Pachelbel’s Canon, an arrangement by Michael Clawson which intertwines these two well-known melodies coupled with the words of the first two verses and chorus of the English traditional carol, The First Nowell. After a duet from Abby Evans and Frances Brightman of the David Bowie/Bing Crosby recording Peace on Earth/Little Drummer Boy, Mo Hunt recited the tongue-twisting poem, Petey the Snake. We Three Kings was another carol for the audience to join in with John Hunt, Hugh Hercus and Edward Dann as the kings. The small group of choir members who put on shows at old people’s homes as the Steventon Singers then sang The Christmas Bells and Jingle Bell Rock. The first half ended with a setting by Roy Ringwald of The Bleak Midwinter (words by Christina Rossetti) and Sing Out the News by Don Bestig and Nancy Price. 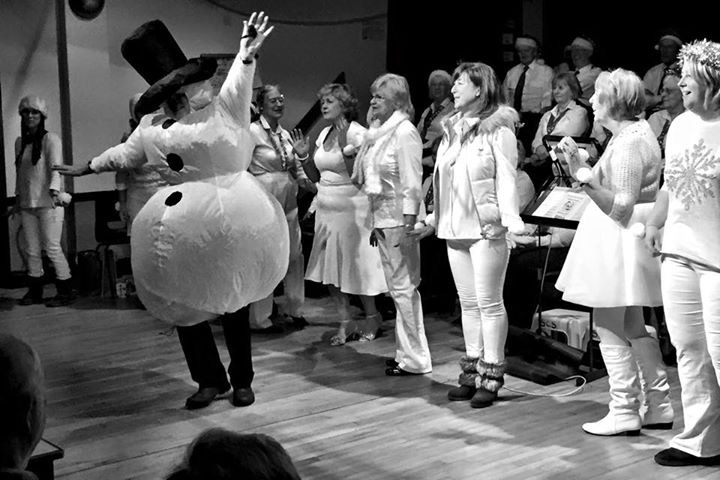 The second half began as ever with Steventon Choral Society’s Dancing Girls, who this year were joined by an energetic snowman to present Frosty the Snowman. This was followed by Mary’s Boy Child sung by Howard Feather and Terry Pearce, accompanied by Terry on the guitar. The choir’s first piece of the second half was A Christmas Blessing, a setting by Philip Stopford to words from the Church of Ireland Book of Common Prayer. Helen Pearce and Helen Bell then sang the duet, Pie Jesu, from Andrew Lloyd Webber’s Requiem. Next Trish Napper read the humorous monologue by John Julius Norwich based on the Twelve Days of Christmas, featuring the supposed thank-you notes from ‘Emily’ to her unseen admirer, Edward; the choir interspersed to provide a choral introduction of each gift and George Russell was G. Creep, solicitor at law. The choir then sang Sing We Now of Christmas, a traditional French carol arranged by John Leavitt. Next was the turn of the audience with two of the most well-known carols of all. Hark the Herald Angels Sing and O Come All Ye Faithful. A small group (Helen Pearce, Rebecca Joisce, Helen Bell, Abby Evans and Frances Brightman) then sang Da Doo Ron Ron (Thursday concert)/Somewhere from West Side Story (Saturday concert) and the Mariah Carey hit, All I Want for Christmas Is You. An arrangement of the Elvis Presley hit, Blue Christmas, from the full choir, a setting of Silent Night sung by Helen Pearce, Trish Napper, Rebecca Joisce, Helen Bell, Danielle Beeken, Caroline Miller, Mo Hunt, Vivienne Dann, Frances Brightman and Abby Evans and the choir singing The Best Christmas of All from Mickey’s Magical Christmas Special: Snowed in at the House of Mouse ended the concert.